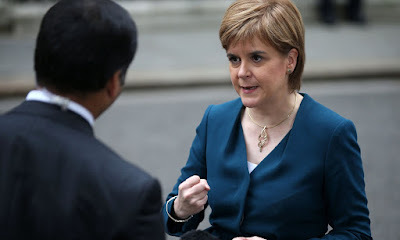 Lily of St. Leonards Lily of St. Leonards: What if the SNP held indyref2 without permission? A complete "no show" by the non Scot Nat parties sounds like an excellent and workable idea. To take it to its next logical step, if the SNP issued some sort of UDI, either after such an illegitimate vote, or in place if it, the UK response should be a combination of the response to the 190's Rhodesian UDI, and China's long standing 'one China ' policy. The Rhodesia side? Work actively to undermine Scotland international credibility. Full scale trade sanctions, physical trade boycotts etc. The One China aspects? Day to the whole world, you can be friends with the UK or Scotland, you can have diplomatic relations with the UK or Scotland, you can have a military alliance with the UK or Scotland, and you can trade with the UK or Scotland, you you can't have both. I the same way that China refuses to have dealings with any cou try that recognises Taiwan, so too should the UK have a standing policy if no relations with any country who recognises an illegitimate Scotland. Watch the doors of the world slam on Steve on quick smart. Rhodesia was physically inaccessible from the UK. Scotland is not. No need to let a UDI state come into existence and have to worry about sanctions: the devolved govt has no means to seize the civil authority over 30K square miles of the UK. FFS , honestly what next gunboats on the Clyde and tanks in George Sq....A surefire vote winner I'm sure. You guys have no clue. Shitting bricks is the phrase that springs to mind. I'll tell you who's shitting bricks RM - SNP MPs in South and North East Scotland. It won't happen because Sturgeon knows the political & economic consequences would be catastrophic for Scotland. She maybe a fanatical separatist but she's not a stupid fanatical separatist. An illegal referendum leading to a UDI would mean Scotland being an international pariah. There would be no access to the EU, NATO, United Nations or any of the economic institutions a country needs to function such as the World Bank & IMF, such institutions do not admit countries off the back of illegal votes and also because the rUK would veto any such attempts of Scotland to join them. Without international recognition, World Bank,IMF membership the money markets wouldn't touch Scotland and it would be shut out of the money markets, therefore unable to borrow money to finance it's spending obligations. Illegal votes and UDI's are the stuff of fantasy for the knuckle dragging goon squad element of the SNP. "UDI" would not mean the formation of a rogue state in Scotland, Martin. It would just provide us with some entertaining TV as the SNP leadership is huckled off to jail and the Scottish Parliament closed down. Some have predicted "troops on the streets" in such a scenario. I honestly don't think it would be necessary. People would just get on about their business. I'd watch that show and enjoy it. It's beyond a joke now, our Parliament isn't fit for purpose with those clowns at the helm. As per my original forecast, if the UK continue to block and Scotland continues to court thr EU successfully as it has done to date. The EU will make the Scottish question part of the negotiation. Scotland will be accomodated by the EU as it weakens the rUK and will put off other countries. The only caveat will be a Yes vote, there will be no UDI as it won't be needed. There will be a vote and it will be aligned with real exit from EU. Scotland is an irrelevance to the EU and is reliant on large amounts of subsidy. The negotiation will be between the EU and the UK as a single unit. EU officials have made this clear. I know thats what you want to believe but there are many many voices in Europe saying otherwise. Scotland remaining while England and Wales exit would be a major coup for the Europeans. What they have made clear is that they will negotiate directly and sympathetically with Scotland if it votes to exit UK and stay in EU. That is 100% clear. What isn't so clear is the concessions that an independent Scotland would have to endure to get in. At a minimum you're looking at austerity, the loss of Sterling, a commitment to join the euro, extra VAT and a commitment to free movement (possibly Schengen). The fishermen will get screwed, again, but your leader doesn't seem to care about them. Maybe all that being at sea makes them not proper Scottish. Perhaps they'd get on better if they were scheme dwelling jakeys. Effie, these are good suggestions for action should SNP declare an illegal referendum. My one concern though us how BBC, STV and our other legions of intrepid, fearless journalists would report this. On previous and current experience it would be perfectly reasonable to suggest that most of the media and especially the broadcast arm would side with SNP and their deranged nationalist aspirations. Debates without an opposition and halls packed with pro-nationalists would probably be represented as an overwhelming sign of the cowardice of Unionists and the inviolability of the nationalist argument. We need stronger, more robust opposition to nationalism. And the stronger, more robust opposition comes from simply telling them 'no'. We already did the debates and the town halls and the voting. We won. Now they are trying to erase that victory and rewrite history. The time for debating with these people is over. From now on its refuse, block, veto, obstruct, delay, ignore, overturn, boycot and frustrate. That's just the way it has to be. sniggers....Haha...what a load of tosh. You can't win a vote so you try to block it. That'll work. We did win it and are now blocking a rerun - as your side would do under similar circumstances. Of course. In the mean time how do we get the 37.77% of the population that voted Yes down? 15-18% of these weren't traditional independence supporters and are soft/hard. Their latent Britishness must be rekindled by reminding them of all the "great things about being British" (Sturgeon), and giving them a positive vision of Scotland in Britain for now and for the post-Brexit future ("Brenaissance", British renaissance). Has the pro-British/unionist movement, if we may now call it a movement, turned the positive corner yet from the reactive and negative position of September 2014, so that we can encourage more and more defections to our trenches across no-man's land and not just be firing verbal stink bombs at these people who are a mixed multitude of soft and hard Nats? Where is your pro British statement, what is your 'reason' for staying on the good ship Britannia ? Other than "naw ye cannae"... There is the issue for you right there, while the yes side are banging on about EU and the Brexit nonsense goes from bad to worse, you lot are just worried about the technicalities and hoping for a draw on those grounds. Face it, yir teas oot and you know it. Its uncanny how quickly you ultra Brits flip to violent descriptions. "Apparently it might be possible for the Scottish Parliament to vote for this even though such a referendum is a reserved matter and therefore outwith the powers of a devolved parliament. I have no idea how serious this suggestion is"
Legally speaking, the Scottish Parliament can hold a vote on *anything*. It can vote to abolish the Queen or the RAF. Technically neither of these things are within the legal competence of the Scottish Parliament and would be struck down by the UK Supreme Court but this could only happen after any vote. People think the Holyrood Presiding Officer is able to prevent bills lacking competence from getting a vote but his opinion is only advisory, can't stop a bill from proceeding, and carries no legal force. However the Presiding Officer can prevent any bill from reaching the Queen for signature whilst the Supreme Court hears the case. So yes the SNP could force a referendum bill through Parliament but I'd suggest this would be a sign of desperation, not strength. I expect the UK Government would challenge an illegitimate indyref2 in the courts - and if they failed to do this, any private citizen or group with enough money could (Gina Miller has already demonstrated that the courts are a excellent weapon against the government, if you can afford them). But, yes, should an illegitimate referendum get off the ground, a complete boycott would be best. I think you would also find that many previous yes supporters would stay away too - recognising that the vote carries no power and represents a breach of the rule of law (I'm assuming at least some Scottish Nationalists still care about such things). So you could end up with a 95% yes on a 30% turnout. And there would certainly be a worldwide reaction to such a result - laughter. Uproarious laughter from Canada to Dubai to Australia. Smith had the support of the Armed forces in Rhodesia in 1965. Sturgeon doesn't. Any UDI would be met straight-away with a UK takeover-. There'll probably be no need to involve the Army. The majority of employed voters in 2014 were those in full time employment and a large number of those will be employed by the state and its agencies.The Chief Constable of Police Scotland will be instructed to arrest the Leaders of the SNP. Any civil servant who co-operates will UDI will have his/her employment terminated without pension. Absolutely spot on. I also think we actually need to bring back treason as an actual crime that is discussed in the media, prosecuted and punished. Not just to deter the sort of political shenanigans we are talking about here, but also to deter espionage and terrorism. It should carry the potential for a whole life sentence, depending on the seriousness of the offence (UDI being obviously one of the most serious possible offences). There is no way Sturgeon would swap her cushty life for 50 years in prison. Look at the state of you clowns....Absolutely shitting yourselves. This is hilarious, if you are not threatening to shut down the SG you are talking about 50 years in prison for democratically elected politicians. The deep fear is taking root and it's a pleasure to watch. Honestly, when you read this garbage it's getting clearer that the union is dead and all that is left is the dregs. I would be careful drawing conclusions about huge political issues from what you read on an internet forum. The last time the union was put to a vote, the unionists won by a big margin. My comments about the Scottish parliament and jailing politicians apply under one hypothetical set of circumstances - UDI. Extreme circunstances call for extreme measures. I'm not for banging people up just because I disagree with them. The response to any illegal or 'advisory' plebiscite is to not vote or obviously spoil the ballot. Brilliant in theory but how many NO voters will panic at the last minute and vote? Let the SNP have an unofficial referendum at their own expense and it would cost them millions out of their own coffers in campaigning for this. Any unofficial referendum should just be ignored and this would make the result null and void. Better still will be the Nats answer to the currency question which will sink them again, that's why they still refuse to tell us what that will be even though they have had years to formulate a plan. The Nats have had a perfect storm as regards the opposition that they have faced in the past, a Labour party with a young charismatic leader could change the face of politics in Scotland, remember where the SNP are now Labour once was. UKIP are dead , its just a matter of the paperwork. The Tories killed them with Brexit. That is what is happening here. Clearly its a bit over your head wee Lil but this is a right wing party internal civil war. The battle is already won and given the Right wingers are in ascendency then the reason for UKIP is over. UKIP - another dead party that fulfilled its purpose. The SNP is very much alive but hasn't fulfilled its purpose. Far better, imo, to do your job and check out than to hang around forever like a bad smell. The British government would need to issue official advice on it, requesting that unionists do not participate. It would also need to guarantee that the vote will be ignored regardless of the result. It might be an idea to try to nail them on some kind of legal point e.g. misuse of public funds. If there is to be an illegitimate referendum, it should be entirely privately funded by those who forced it. Your Prime Minister says don't vote....FFS, even the Tories in London are not that stupid. She would be entitled to offer such advice if the SNP held a rogue poll. This from someone who thinks secession referenda should be held at the drop of an SNP hat. First thing, dont you think that you should acknowledge - in the interests of accuracy if not fairness (I doubt you could manage that) - that while the SNP lost their overall majority in 2016, their vote compared to 2011 (last Holyrood election) and also was the first time any party had polled over 1 million in the constituency vote. But I suppose fairness and honesty is just too much???? then you write "There has been the suggestion from Scottish nationalists that they might hold an independence referendum without the permission of the UK Government. Apparently it might be possible for the Scottish Parliament to vote for this even though such a referendum is a reserved matter and therefore outwith the powers of a devolved parliament". Now that, at the moment is nothing more than talk. It is said that Salmond contemplated this in 2011 but then Cameron came through with the S30 order so it was taken no further. The point is that if a question such as "Do you think that the Scottish Government should enter into negotiations with the UK Govt about Scottish independence?" it might not encounter the limitations of the Scotland Act. Now note, I am not saying it would without doubt be legal. The important point here is though that you have gone straight to "its illegal". End of. This would be something that ends up in Court, and as we saw with the Article 50 they dont always come out as expected, or as the government wants. But lets suppose that you are right, where would that leave us? In a position similar to Catalonia perhaps. I dont imagine for a minute that you read George Kerevan's article in the National last week (if not you can find it here http://www.thenational.scot/comment/15213838.George_Kerevan__Forget_Brexit_____the_true_European_faultline_today_is__in_Barcelona/?ref=mrb&lp=29). The most important point he makes is that the irresistible political force is about to meet the unmoveable political object. Quite how even that one will work out I dont know, but I do know that the recalcitrance of the government in Madrid has aided the Catalan cause. And what would you do about it? Close Holyrood down! Brilliant. I can scarcely imagine an act better suited to maximising support for Scottish independence. You do know that support for doing this stands at something like 8 (eight) percent. Even Johann Lamont is on record as saying that if there was an attempt to close Holyrood she would vote for indy (http://www.heraldscotland.com/news/13178466.Lamont__I_would_back_exit_from_UK_if_Holyrood_was_threatened/). To quote Clint Eastwood - "Go on punk - make my day". No one's talking about closing the regional assembly in Edinburgh. But it could be an option if the SNP attempts the highly illegal move of UDI. The system of government in Northern Ireland has been halted, suspended and reformed many times. Westminster has the ability to do that in Scotland too, should extreme circumstances emerge (such as UDI). Surely that goes against the Scotland Act...Is it not the case that Scottish Parliament is permanent ? I've known since I was 8. Now a GE in June, very interesting development. One thing for sure, politics is not dull at the moment. I would not expect SNP to retain all seats they did as some of their MSP's have been quite crappy IMO. However I'll take removal of Mundane and no Tories in Scotland as a victory of sorts. I expect the Tories to have at least 3 seats in Scotland (and possibly many more) after this GE. I would expect Mundell to stay. Lib Dems will keep the northern isles and add one or two mainland seats. Labour may well be wiped out - but something tells me they'll clinch at least one somewhere. Overall result will be a landslide majority for the conservatives. Unless there is a game changer - like a war breaking out on the Korean peninsula. I would expect the left to do much better under those circumstances, due to tories traditional hawkishness and atlanticism. The scale of the swing from SNP to Tory brings about 6 seats easily within the Tories' reach - and that's before any tactical voting campaign has even began. More worrisome for the SNP should be the possibility of pro UK parties winning an absolute majority of the votes in Scotland - or Theresa May winning a UK wide majority on a manifesto of "no indyref2". She could then claim a competing mandate not to hold a referendum. These are the really important things. The tories grabbing a few seats here and there is a bonus - albeit a welcome one. Tory support has been flatlining for years, are you actually believing your own BS now ? Do you really think hundreds of thousands of SNP or Labour voters across the country will switch to Tory ? Two polls out today - one shows Tories on 28%, the other 33% - their highest rating in Scotland since the early 1970s. The SNP and their pals have clearly awoken something in Scotland - a desire to protect Britain and an antipathy towards the left wing dogma and political correctness that is espoused by parties like the SNP. It just happens that the best vehicle - the only vehicle - for such political thinking in Scotland is the Scottish Conservative Party. The next Tory government will have around 50% of the UK vote. Add in UKIP and you've got about 55-60% of British voters who voted for right wing, unionist and anti-EU parties. So the British government will have moral as well as legal authority in that its fundamental ideas chime with a majority of the voters. The SNP cannot claim this if SNP+pals get less than half of Scottish votes. How can they claim a mandate for indyref2 if a majority of Scottish voters - despite brexit, despite Theresa May's "now is not the time" comments - still vote for parties and candidates that are pro United Kingdom? You might as well walk into a Vegan restaurant and say 'right, who's for steak pie?'. Why is it that when the SNP get 50% of the vote its a one party state and when you right wing loonies anticipate one its suddenly a moral authority ?